Do you know how many portal sites Microsoft Azure has? Almost all users access only "Microsoft Azure Portal". "Microsoft Azure Portal" manages all Azure resources such like VMs, App Service, SQL Database and others. 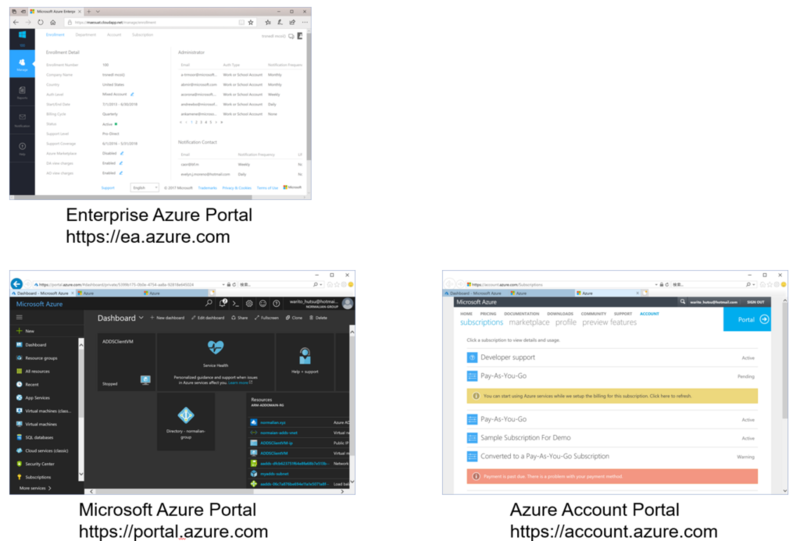 In addition the portal site, Microsoft Azure also offers two other different portal sites as "Enterprise Azure Portal" and "Azure Account Portal". "Enterprise Azure Portal" manages Azure subscriptions, subscription administrators and billing reports. This portal is mainly used by billing administrator in your company. "Azure Account Portal" manages all Azure resources. This portal is mainly used by developers. "Microsoft Azure Portal" is mainly used for create, transfer, cancel subscriptions. This portal is mainly used by developers. You don't need to use "Enterprise Azure Portal" if there are no EA contract with Microsoft in your company. Almost all users who use only "Pay-As-You-Go" Azure subscriptions need to use only "Azure Account Portal" and "Microsoft Azure Portal".